One of the appeals of living in North Buffalo, or the city in general for that matter, is being immersed in the beauty and charm that comes with the 100+ year old houses. We truly love our 1910 house with all its history and character and curb appeal. 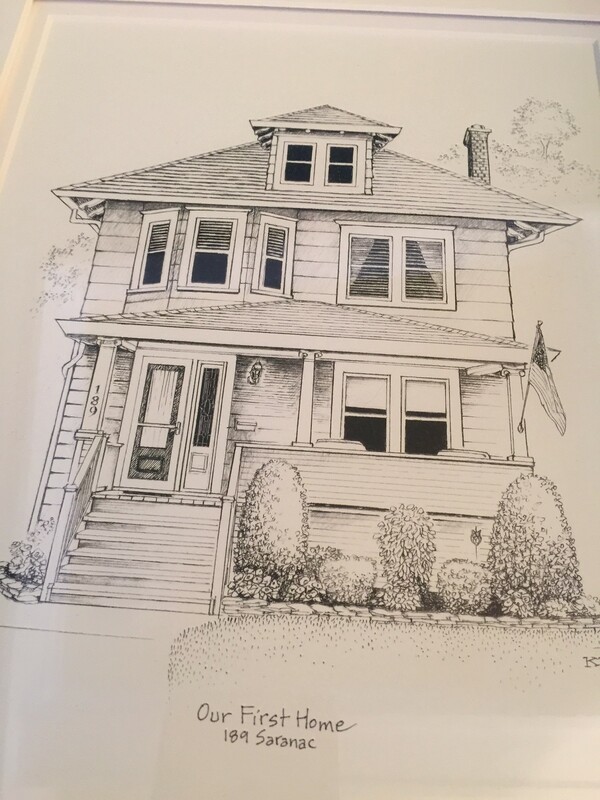 So last year, when our friend Julia sent us a holiday card with a drawing of her house on the cover, we were impressed (and maybe even a little envious). Obviously, at that moment Karen and I both decided it was imperative that we have a drawing of our house done at some point as well. Here’s where the funny part of the story comes in. 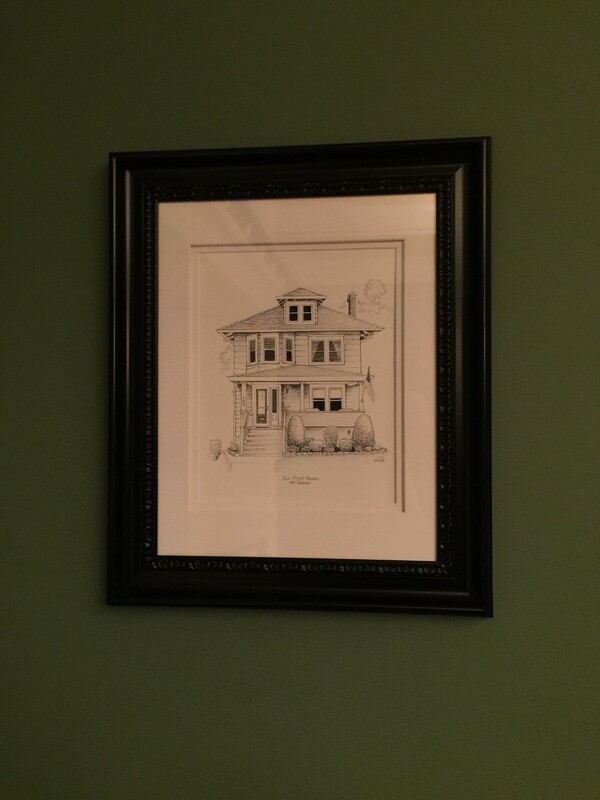 I acted quickly and enlisted the services of Karen Matchette, the artist who drew Julia’s house. Our house on Saranac was precisely drawn, double matted, framed and wrapped in August – a solid four months ahead of Christmas! Surely a record for me. Fast forward to last week, and Karen starts snooping around for the same person’s contact information to have the same drawing done for my Christmas gift. We are sooo soulmates aren’t we? It was definitely cute that we both had great intentions for the same holiday gift, but it did add an element of stress. In Julia’s frantic attempt to preserve my surprise while staying a loyal friend to both of us, she did the only thing she could do and lied to my wife. Mysteriously, as the story went, the artist upped and moved of town last month. Yea, not really, but it seemed plausible. She loved it. We love it. Then we laughed about our parallel journeys toward getting this done. Then we immediately reached out to Dana with an apology and a request to rip up the check she’ll soon be receiving. Then we hung it up. Then we wrote this blog. In the end, we have a permanent commemoration of our first home that will hang on our wall for years to come. Should we ever leave this old, beautiful house, it’s great to know that, through this picture, it will always be with us no matter where we are. And you as a reader, now have two wonderful references should you wish to have this done for your house!